SOWETO, South Africa (AP) — President Thabo Mbeki led hundreds of South Africans on a June 16 march in the footsteps of children whose bloody uprising 30 years ago reshaped the struggle to end apartheid. The fight then was against a racist regime that confined black students to inferior schools and forced them to learn in a language they did not understand. Today, Mbeki told tens of thousands of young people gathered in a Soweto soccer stadium, that they must rise up against poverty, illiteracy, violence and AIDS. Linking arms, students, government leaders and veterans of 1976 marched through this black township, pausing at 9 a.m., the moment when police bullets felled their first and youngest victim, 13-year-old Hector Pieterson. His death in the arms of another protester — captured in an iconic photograph — rallied generations to the fight for South Africa’s democracy and freedom. The brutality of the police response to the unarmed students sparked nationwide rioting in which more than 500 more youths are estimated to have been killed. Thousands of others were maimed, disappeared into detention or fled the country to join the guerrilla fight. Mandla Malinga, a 46-year-old builder, was among the student protesters who began that cold winter’s day — now a public holiday — with so much optimism. He was back to pay tribute to those who did not survive. Martin Mhlanga, 51, injured in a car accident a year ago, watched the march from a wheelchair in front of his home, his pigtailed, 2-year-old niece leaning against his knees. He said he wanted her to know about an important moment in her country’s history. What came to be known as the Soweto Uprising started as a student protest against being taught in Afrikaans, the language of the white oppressor. As rioting spread, it drew world attention to the regime’s violence and injected new life into the struggle to topple it. The two-hour march ended at a memorial to Pieterson, where Mbeki and families of the slain lay wreaths of colorful flowers. 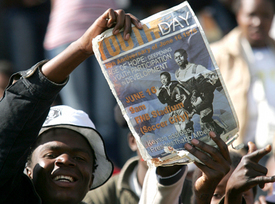 At the concluding rally, Mbeki saluted the youth of 1976 for helping free South Africa from the tyranny of apartheid. “We would like the youth gathered here today and their comrades throughout our country to follow their example of unwavering commitment as they confront the modern day challenges of poverty and unemployment, alcohol and drug abuse, AIDS and other diseases, illiteracy, women and child abuse, and other problems,” Mbeki said.